The Queen is shown holding an orb and sceptre and looking towards her left. She wears a crown and bejewelled dress. The statue for which this was a model has since been lost, following the fire at the Exchange of 1838. John Nost was a native of Malines in The Netherlands. He is first recorded in England around 1678, working at Windsor Castle under Hugh May. His workshop was in the Haymarket and he specialised in lead figures, though he also worked in other materials, such as stone and terracotta. He had many important patrons and was commissioned to make a number of garden figures for great houses and palaces, including Castle Howard and Hampton Court Palace. 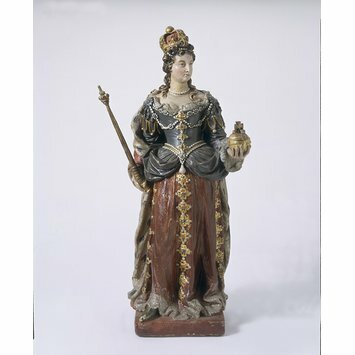 Statuette, painted terracotta. 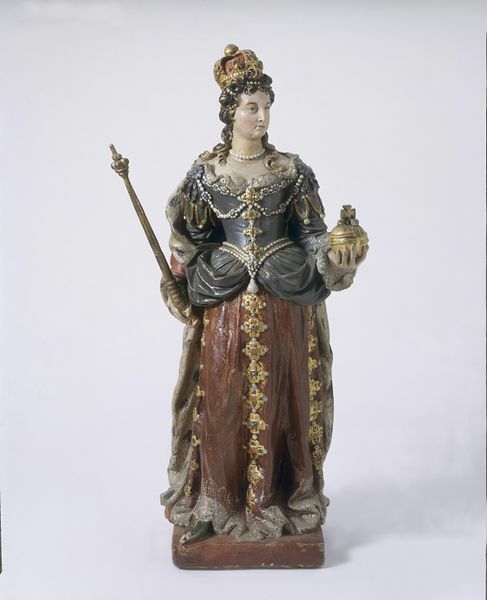 The Queen in coronation robes stands with right foot forward on a dark red block. She hols a sceptre in her right hand and an orb in her left. Her crown is somewhat uncomfortably far back on the head. She weas a dark blue robe over a dark red petticoat edges with lace and adorned with three vertical rows of gold and jewelled quatrefoils. The bodice is embroidered with pearls and other jewels and the quatrefoil design on the petticoat is continued on the bodice which is edged with lace at cuff and throat. The sleeves are enriched with lapets below the shoulder. She wears a tight pearl necklace and her hair is ornamented with pearls. A heavy red cloak, lined with ermine, hangs from the shoulders and is looped over the right arm. Possibly modelled by John van Nost (possibly born in Mechelen, The Netherlands, active in England from about 1678, died in London, about 1712). Previously owned by the donor's mother, Lady Younghusband. The donor 'understood from her [mother] that is was one of the statues of Kings and Queens of England which stood in Gloucester Cathedral, until they were removed many years ago'. Given by Miss Eileen L. Younghusband, Holland Park, London, in 1946. Smith, N, 'Great Nassau's Image, Royal George's Test', The Georgian Group Journal VI, 1996, p. 12 and p. 21, note 4. Roscoe, I, 'The Statues of the Sovereigns of England: Sculpture for the Second Building, 1695-1831' in Saunders, A (ed.) The Royal Exchange London, Topographical Society, publication 152, 1997, p. 176, fig. 63.